HomeCity Real Estate sent a team to spend the morning volunteering at the Umlauf Sculpture Garden and Museum, on March 7th, 2014. Umlauf Gardens is an Austin treasure, offering patrons a shady garden of native Texas plants and a natural oasis near Barton Springs that features sculptures given to the city of Austin by noted American sculptor Charles Umlauf. 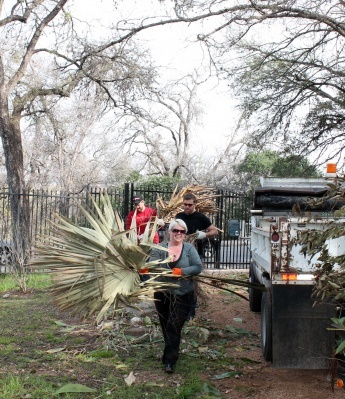 Realtors and management pulled weeds, cleared brush, and clipped berries of an invasive species in order to help keep the gardens beautiful for all Austinites to enjoy. Located just blocks from Downtown Austin, the Umlauf Sculpture Gardens are a local favorite. Originally, the gardens contained small ponds used by soldiers to practice flycasting during the late1930’s and 1940’s. After that, the four acres of land were ignored for decades, covered in brush and used as a dump site. In 1991, the gardens were cleaned up and transformed into a place to display the dozens of bronze and stone pieces given to the city of Austin by noted 20th century American sculptor Charles Umlauf. The art, set in nature, provide a unique place for anyone to visit. The garden has waterfalls, streams, and a giant gravel path laid out as a giant peace symbol. HomeCity Real Estate’s commitment to community involvement is exemplified through its continued participation in community service events. If you would like to support Umlauf Sculpture Garden and Museum, you can visit http://umlaufsculpture.org/support/ to find out how to volunteer, donate, or sign up to become a member.